Maselli's truck is super-sized and on show at Florence's Twentieth-century Museum. Truck, painted in 1967, is a three-panel work whose total length equals nearly 15 feet. It showcases her 'signature' colors—black, orange and green. The conservation of Truck brought about a nice surprise for conservator Rossella Lari: "A painting is truly a physiological entity," Lari explains. 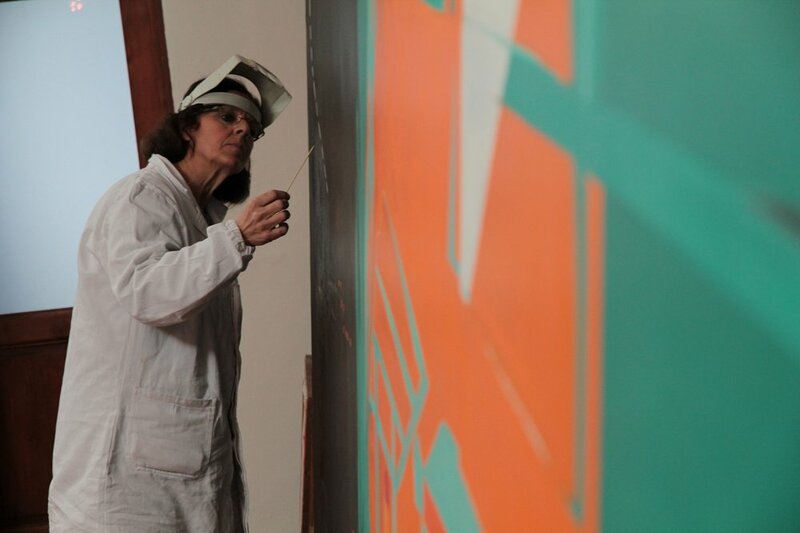 "Titina Maselli’s work had various drops of paint that were still soft—still fresh! That is something you never find when working with ancient paintings!" Rossella exclaims. Restored in 2014, the painting is now on display at Florence’s Twentieth-century Museum. The venue, with was a long-time Florentine dream, chose Maselli's work as one of its poster children to establish the newly founded museum's identity. Because of its impressive size, it was restored directly in the City's deposits, directly overlooking Piazza Santa Maria Novella, just a stone's throw from the Museum itself.